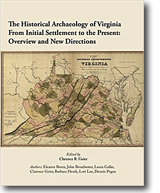 The Historical Archaeology of Virginia From Initial Settlement to the Present, edited by Clarence R. Geier, $25. The book includes six chapters that cover Virginia history from initial settlement through the 20th century plus one that deals with the important role of underwater archaeology. Written by prominent archaeologists with research experience in their respective topic areas, the chapters consider important issues of Virginia history and consider how the discipline of historic archaeology has addressed them and needs to address them . Changes in research strategy over time are discussed , and recommendations are made concerning the need to recognize the diverse and often differing roles and impacts that characterized the different regions of Virginia over the course of its historic past. Significant issues in Virginia history needing greater study are identified. A Field Guide for Virginia Archaeology (and the Middle Atlantic Region, in General): A Practical Guide to a Dirty Business, by Michael B. Barber, $15. 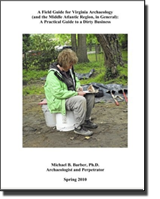 This book provides guidelines and instructions on conducting archaeological fieldwork. Written with humor, the author tells you not only how to do the work of archaeology but also why the work needs to be done a certain way. Includes forms that can be reproduced for your own use and a list of recommended readings. 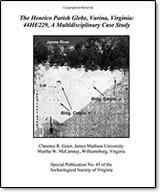 This book introduces the reader to the historical and archaeological evidence of a significant Colonial Period habitation on the James River believed to have been seriously impacted by 17th and 18th century floods and hurricanes. The interpretation of the Henrico Glebe Site, located within Henrico Parish Glebe lands at Varina, opens the door to a discussion of the role of the Church of England in the Virginia Colony and the types of housing parish leaders were obliged to provide to the clergy. Included is a rigorous discussion of Virginia legislation and parish records, as well as a physical description of the diverse residences and service buildings based on archeological findings. COVA is dedicated to the preservation and study of Virginia’s archaeological resources, fostering public awareness, knowledge, and support for the preservation of Virginia archaeology, and acts as an independent professional advisory group for the Virginia Department of Historic Resources. The VDHR maintains information on the Commonwealth’s historic architecture and archeological sites. It’s mission is to foster, encourage, and support the stewardship of Virginia’s significant historic, architectural, archeological, and cultural resources. Guidelines for Conducting Historic Resources Survey in Virginia. These non-regulatory guidelines are implemented and distributed by the Virginia Department of Historic Resources. Passport in Time (PIT) is a volunteer archaeology and historic preservation program of the USDA Forest Service (FS). PIT volunteers work with professional FS archaeologists and historians on national forests throughout the U.S. on such diverse activities as archaeological survey and excavation, rock art restoration, archival research, historic structure restoration, oral history gathering, and analysis and curation of artifacts. New PIT volunteers receive a “Passport” and each time a volunteer visits a project, the project leader stamps the volunteer’s passport and documents their hours from projects all over the country! VCNS preserves and enhances Virginia’s rich inland waterways heritage in all its fascinating aspects, including history, exploration, archeology, modeling, local lore and legend, restoration, preservation, park and trail development. This website offers historical information, lesson plans, bibliographies, and links to tribal home pages. The site includes sections on the Powhatan Indians as well as on topics of early colonial history such as Jamestown and Sir Walter Raleigh’s expeditions. Much of the information is provided for younger readers, who may be researching class projects. The site is fully searchable and contains an index and sitemap. This website offers information on current research, lab activities, volunteer opportunities and information with a focus on studies of Invertebrate Paleontology, Vertebrate Paleontology, Recent Invertebrates, Archaeology, Mammalogy, Marine Science and Geology. This website offers historical information on a variety of sites and locations that contain information about Virginia’s past, including library and archival sites, as well as sites for kids and families. Provides written papers on all aspects of historical archaeology via a newsletter and a journal series—the premier North American historical archaeology publication series. Provides written papers on all aspects of prehistorical archaeology via a newsletter and a journal series—the premier North American prehistorical archaeology publication series. JFA publishes a quarterly journal devoted to field archaeology. JFA is a mix of theoretical and practical application for field and analytical studies in archaeology. This site provides detailed lists of resources related to African American archaeology, cultures, and history, divided into topical and regional sections, including the Mid-Atlantic region and Virginia sites. The Maryland Historical Trust was formed to assist the people of Maryland in identifying, studying, evaluating, preserving, protecting, and interpreting the state’s significant prehistoric and historic districts, sites, structures, cultural landscapes, heritage areas, cultural objects, and artifacts, as well as less tangible human and community traditions. The Maryland Archaeological Conservation Laboratory’s Diagnostic Artifacts in Maryland web site has been created to provide an introduction to some of the most significant types of artifacts recovered from archaeological sites in Maryland. 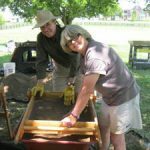 Their goal is to assist the professional archaeologist, and anyone else with an interest in Maryland archaeology, to recognize the objects typically found here, and to become familiar with the descriptive terms commonly used in this area. 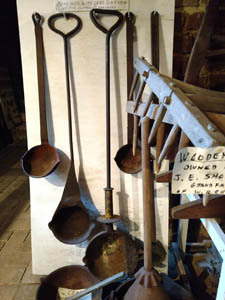 But many of these artifacts have a far broader geographical range than just Maryland, so we hope the web site will be of use to a wide audience. The Archeological Society of Delaware (ASD), founded in 1933, is a statewide organization of avocational and professional archeologists devoted to the study and conservation of Delaware archeology. The Archeological Society of Maryland, Inc. This is the state’s oldest nonprofit organization devoted to the preservation and study of the state’s archaeological past. WVAS publishes West Virginia Archeologists twice a year, has an annual meeting, records sites, assists in fieldwork and has a mission of site protection and dissemination of archaeological information. West Virginia’s State Historic Preservation Office with the mission to encourage, inform, support, and participate in the efforts of the people of West Virginia to identify, recognize, preserve and protect West Virginia’s prehistoric and historic structures, objects and sites. Museum for the Adena period Grave Creek Mound complex. The Grave Creek Mound is the largest Adena mound. Composed of professional archaeologists working in West Virginia or with research interests here. Nearly all are associated with government agencies or the consulting firms that do much of the actual exploration and excavation required by Federal law. CNEHA is dedicated to archaeological scholarship of the historic period in the American Northeast and extends as far south as Virginia. MAAC meets annually, in early spring, for three days of papers, discussion groups, special workshops, a business meeting, and, of course, a party to catch up on what all our colleagues have been doing for the past year! The Southeastern Archaeological Conference (SEAC) was founded in response to the tremendous increase in federally funded archaeological work in the Southeast during the 1930s. SEAC was created to allow excavators to quickly share new data with each other and to standardize ceramic types. The National Preservation Institute (NPI) is a nonprofit organization offering specialized information, continuing education, and professional training for the management, development, and preservation of historic, cultural, and environmental resources. The National Archeological Database (NADB)—a computerized communications network for the archeological and historic preservation community—is an internationally recognized source of information on public archeology. NADB was established to meet a congressional directive to improve access to information on archeological activities nationwide. Archaeometry is an international journal covering the involvement of the physical and biological sciences with archeology and art history. The topics covered include dating methods, artifact studies, mathematical methods, remote sensing techniques, conservation science, and the study of man and his environment. The Society for Archaeological Sciences (SAS) was founded to establish a forum for communication among scholars applying methods from the physical sciences to archaeology and to aid the broader archaeological community in assessing the potentials and problems of those methods. The SAS promotes such communication through its distribution of the SAS Bulletin; Advances in Archaeological and Museum Science series; and SASnet, an electronic forum on the Internet. The Historical Metallurgy Society (HMS) was founded to establish a forum for communication among scholars interested in the use of metals in the past. The HMS promotes such communication via its electronic forum on the Internet and via a newsletter. The Association for Industrial Archaeology (AIA) was founded to establish a forum for communication among scholars interested in the archaeology of industry, primarily in the UK and Northern Europe. SIA has a worldwide membership of over 1,800 individuals who have a strong interest in preserving, interpreting, and documenting our industrial past and heritage. Whatever your profession or favorite pursuit, if you share our interest in the industrial past, we welcome you to join us. ArchNet serves as the World Wide Web’s virtual library for archeology. This server provides access to archeological resources available on the Internet. Information is categorized by geographic region and subject. Internet Archaeology is the first fully refereed e-journal for archaeology. This site contains links to many archaeological websites and publications, including Archaeology magazine, Discover, Biblical Archaeology Review, Archaeology Odyssey Magazine, and Kids Discover, among others. Siftings is an eclectic mixture of news, announcements, and documents from participating organizations. Resources include membership forms, calls for papers, preliminary conference programs, back issues of publications, copyright releases, links, and more.